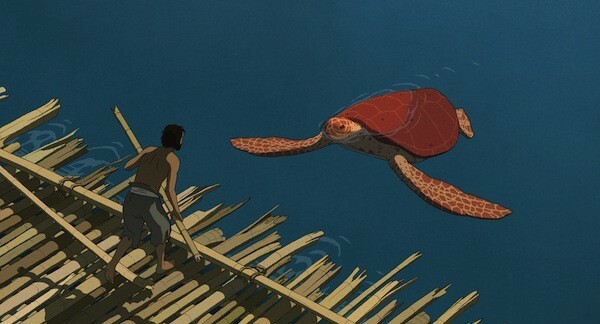 The Red Turtle (aka La tortue rouge) stands as the first Studio Ghibli movie that isn’t primarily a Japanese production. Instead, the outfit behind such hits as My Neighbor Totoro and the Oscar-winning Spirited Away put its faith in Dutch animator Michael Dudok de Wit after studio founder Hayao Miyazaki caught de Wit’s animated short Father and Daughter. It was a move that paid off, as the picture was one of the five Academy Award nominees this year for Best Animated Feature Film (a statue deservedly won by Zootopia). What’s more, as the movie is backed not only by Japan’s Studio Ghibli but also by British, French and German financiers, it further promotes the theory that cinema continues to expand its borders even as other aspects of the world around us continue to throw up walls at every opportunity. Certainly, the film itself is all about tolerance and acceptance, as a man who finds himself deserted on a tropical island encounters a large turtle that becomes his constant companion. I won’t reveal exactly how the turtle becomes an integral part of his life, but it involves a transformation that in turn transforms the direction of the film. Related with no dialogue and illustrated in an uncluttered yet often luminous style, The Red Turtle is ultimately a mediation not only on what it means to be human but, more significantly, what it means to be as one with the natural order of the world.